Vacuum Sealing Systems have been around for a while but I am used to the old school way of packing my harvest. Try out one of these great packaging systems now. Your butchered meat, burger, fish and pre-prepared meals will surprise you. 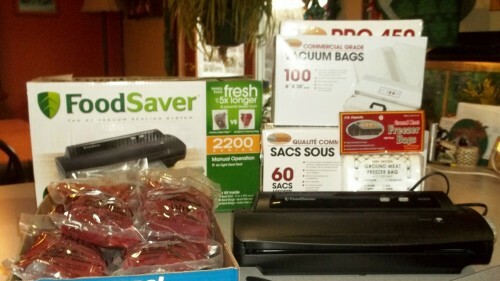 Bob Wards has a full selection of Vacuum Sealing gear and bags. With Christmas coming up, this would be a great gift. Fishing and hunting is also a great way to enjoy life. Harvesting your fish, fowl and meat is a wonderful way to feed your family and friends. I do not take any of my harvest to a butcher or processor. We have all had our ups and downs when someone else finishes what we started. Unwanted hair, scales, bone or dirt does not make for a tasty presentation. For decades, I have also double wrapped my wild game and fish using plastic wrap, baggies and freezer paper. This tried and true method was fine until now. The whole point of freezing our food is so we can preserve our future meals. We expect them to stay fresh and flavorful. After about 3 months, our frozen bounty starts to go downhill. The longer we keep it, the worse it gets. We all know buddies that have frozen meat and fish from years ago. What an incredible waste. Wild game is delicious! This meat is also more expensive than store bought food. If you were to add in the costs related to hunting and fishing, we would discover that it’s cheaper to just go and buy our meat and fish. But what fun would that be? Food frozen in Vacuum Sealing Systems, extend freshness and keep food 5 times longer than other methods. I found that they are quicker to package and use than other wrapping methods. The finished labeled product also looks great. One great surprise is using pre-made frozen meals. Preparing Biscuit gravy ahead of time is a great example. Your Vacuum Sealed biscuits and gravy can be heated in a pot of boiling water. When hot, cut open the bag and serve. The hot water can then be used for coffee or washing. Soup, meat loaf, spaghetti or any pre-made meal can be re-heated in this manner. You can be a creative and speedy cook with minimal cleanup. If you can boil water, you can serve a meal to hungry campers fast and easy. One of my new sealed meals is Meatballs! We all love them on a sandwich, soup or pasta. Meatballs just take a long time to make. I make a big batch ahead of time and Vacuum Seal them. Re-heat using the boiling method and you are meal ready. 1 ½ lbs. ground meat, ¾ cup Quick Oats, 1 cup milk, 3 tbsp. finely chopped onion, 1 ½ tsp. of salt, black pepper to taste. Combine meat and oats in a bowl. Pour in the milk. Add the onion and salt and pepper. Combine gently. Roll or scoop the mixture into golf ball size balls. I use a tray to set them on and allow them to rest in a refrigerator for 30-45 minutes. Dredge the chilled meatballs in flour and brown in 4 tbsps. canola oil. As they brown, place them into a baking dish and bake for about 40 minutes at 350 degrees. Sauce; Mix 1 cup of ketchup, 2 tbsp. sugar, 3 tbsp. vinegar, 2 tbsp. Worcestershire sauce, 6 tbsp. minced onion and a dash of Tabasco. Heat and serve for a great add on. Now that you have a pile of Montana Meat Balls, freeze them in your Vacuum Seal Bags for later. Even Montana Grant can learn new tricks!